Too often, baseball players and other sports stars are judged solely by statistics. When measuring one player's value versus the next, most of the time, it is a strict battle between things like the number of wins, home runs, and Gold Gloves. What gets left out of the debate are the intangibles and the sheer impact of the player, aside from the numbers. In the following piece, Joe Orlando discusses the impact of the legendary Jackie Robinson and how his legacy goes far beyond the numbers alone, not just in the game of baseball, but in the hobby as well. Along with other iconic baseball players like Babe Ruth, Mickey Mantle and Ted Williams, Jackie Robinson is usually at the top of most autograph collectors' lists. The Brooklyn Dodger legend was not only the man who broke the color barrier in baseball and a fine player on the field, Robinson also passed away at the young age of 53 in 1972, which makes his autograph much tougher to come by compared to most other players who rose to stardom during the late-1940s and 1950s. In the next article, we take a closer look at Jackie's prized signature. The 1972 Topps football set consists of 351-cards and contains several rookie cards of some of the finest players. Rookie cards for Archie Manning, Jim Plunkett, and Roger Staubach, just to name a few, and colored borders make this set a favorite amongst many collectors. This collector has populated his set with many top pop cards and has a set rating of 9.55, very close to the Finest Possible of 9.82. Click here to view this great set. SCP Auctions' April Auction to Include Prominent Items from NBA Great John Havlicek and MLB All-Stars Steve Garvey, Rollie Fingers and Bret Saberhagen. Ends April 26 and 27. 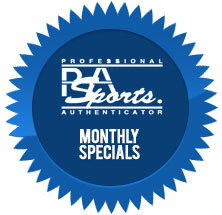 SportsCardLink April Auction Is Underway at sportscardlink.com! Auction Ends April 25. Sirius Sports Cards Auction #79 Now Open for Bidding - Auction Ends April 18. REA Blockbuster Auction Features Baseball Collecting World's Greatest Treasures Including T206 Honus Wagner. Breaking a High Grade 1951 Bowman Baseball PSA Graded Set - All PSA 8 - Ending April 17 and April 18. 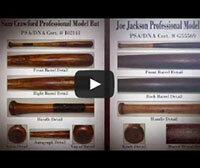 Greg Bussineau Sports Rarities Announces Successful Completion of Its Spring 2013 Auction. Which of the following non-Jackie Robinson, 1950s Brooklyn Dodger cards do you think is the most desirable?